An online gambling fan has started the new year with a stunning win at Royal Panda. The fortunate player in question, who gave his name only as Harrie, crammed his wallet with a whopping €113,906 in cash. 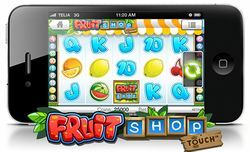 He was spinning the reels of the entertaining Fruit Shop Touch video slot when he struck oil. The 30-year-old gambling enthusiast will definitely enjoy the start of 2016 after cashing €113,906. A rewarding mix of fruit symbols, wilds, and free spins resulted in the staggering win. Harrie first triggered the free spins mode, which comes with a x3 multiplier. The Royal Panda customer scooped a €39,195 payout thanks to a couple of cherries and a wild symbol. Subsequently, Harrie played with several €150 bets that netted him another €74,711.47. At the end of the remarkable session, he had collected €113,906.47 in winnings. The fact that he won the massive amount with a €300 deposit makes it even more insane. Harrie is a silver member in Royal Panda’s loyalty program after collecting 15,000 Loyal Panda Points.